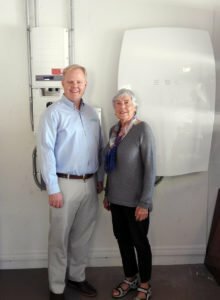 For Rotraut Bockstahler and her husband, Larry, environmental stewardship and energy security have driven their energy choices. The couple has an 8.32 kW solar array, nothing too flashy – but the cool factor jumps to 11 once you check out the Tesla Powerwall 1.0 home battery in the garage. The Bockstahlers installed solar on their previous home – just a few miles away in Sarasota – in 2013. They were having technological issues and called on Brilliant Harvest (who did not perform the original installation) to help resolve them. When the couple moved to their current home, they hired Brilliant Harvest to install a solar array in tandem with the Powerwall 1.0 home battery. They flipped the switch on the system in December of 2016. It was a matter of environmental stewardship and having an energy safety net for the Bockstahlers, both of whom come from a science background. Larry was a research scientist for the FDA; Rotraut was a biologist. Larry has health issues which, while not life-threatening, require certain appliances to be functioning at all times. Additionally, both are vitally concerned about the health of our planet. The financial benefit has been significant as well. Rotraut notes that their power bills are approximately half of what they were before flipping the switch. She also loves the monitoring system, which enables her to see how much energy they are generating and how well the system is performing. Brilliant Harvest is the only Tesla Energy Certified Installer of the Tesla Powerwall home battery in our area. We have installed five Powerwalls so far and the new Tesla Powerwall 2.0 – which, at 14 kWh, has more than double the storage capacity of the 1.0 – is now available to order. Please call us for more information or for a quote.